Crew 6 experienced, trained and IMO-certified crew-members (International Marine Organization):captain, pilot, sailor, machinist/engineer, cook and bartender/waiter. Our 4 nights western route visits some of the remotest corners of Galapagos. 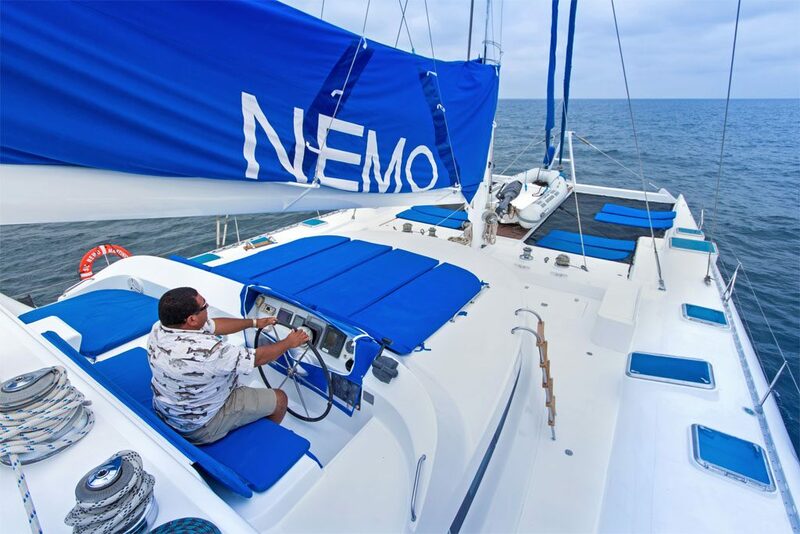 This adventurous route contains longer nightly navigation stretches, but Sailing Catamaran Nemo I is faster than average, and you will also have two relatively quiet floating nights. After an introduction at Charles Darwin Research Centre (Galapagos giant tortoise breeding centre) you will round the by far largest island Isabela, and pass by pristine Fernandina, which are both just recently born out of fire. On its way back Nemo I will anchor at Santiago’s James Bay (fur seal grottos and great snorkelling) and sail around the sea bird laden volcano islet of Daphne Major. Though less frequented than popular central and south-eastern islands, the desolate west is truly exceptional. Become witness of some bizarre miracles of evolution, such as flightless cormorants, huge marine iguanas and Galapagos penguins close to the equator. Discover how pioneer species conquer barren lava fields and create habitats for new colonist species. En route you will have chances to see emblematic and endemic Galapagos land iguanas, American flamingos and exciting whale watching! • Itinerary is subject to change in case of force majeure caused by exceptional and natural circumstances. • Approximate departure and navigation times are just indicative and depend on the sea state and decisions of the captain. • Although Galapagos seldom requires quests for wildlife, observation of specific species can never be guaranteed. After arrival at Baltra your tour will start on adjacent main island of Santa Cruz, where you will cross the surprisingly lush highlands by bus and reach its cosy harbour town Puerto Ayora. A visit to the Charles Darwin Research Station and the famous Galapagos giant tortoise breeding center is an interesting introduction to this unique archipelago. AM: This morning you will fly from Quito or Guayaquil to Baltra Airport. osy town of Puerto Ayora. Overnight navigation: Before dinner your naturalist guide will give the first daily briefing, and the captain and his crew will present and share a welcome toast. The anchor will be lifted early for this route’s longest navigation to Moreno Point on Isabela, about 12 hours in southwestern direction. At Baltra Airport you have to pay your Galapagos National Park entrance fee and your luggage is inspected. for flight and arrival information. In front of the arrival hall you will meet your naturalist guide and fellow passengers, and the airport shuttle will transfer you to the ferry across the Itabaca Channel. On Santa Cruz you continue by bus through the lush highlands to the harbour of Puerto Ayora. Our inflatable dinghies (‘zodiacs’) take you the last stretch to the yacht. The Charles Darwin Research Station (CDRS) and the headquarters of the Galapagos National Park Service share same location on the outskirts of Puerto Ayora. From here biological research and indispensable conservation management of this unique archipelago are directed. The complex houses a bunch of interpretation and information centers about the National Park and the Galapagos Marine Reserve around. Most memorable from your visit will probably be the successful breeding center and the enclosures with Galapagos giant tortoises; even after the death of its world famous resident, emphatically called ‘Lonesome George’ († June 2012; the last known individual of the Pinta subspecies, who sadly failed to reproduce offspring). Most remaining adult giant tortoises in the corals are former pets and many of them are accustomed to human company. In the next few days SC Nemo I will navigate clockwise around Isabela, by far the largest island of the archipelago. Its larger living space seems to cause that evolution is hunting for records over here (although some are disputed). Explore some of the remotest visitor’s sites in Galapagos, offshore rocks with a small colony of Galapagos penguins, and penetrate Galapagos’ highest mangle in the sheltered creeks of the estuary. Perceive how pioneer vegetation progressively converts barren lava fields into lush oases and evergreen mangle forests, and is creating new habitats for specific species. Thanks to major upwellings out off the deep sea (Cromwell Current) the nutrient-rich west coast of Isabela is a magnet to all kinds of marine and birdlife. Bolivar Channel (between Isabela and Fernandina) can be great for whale watching. AM: After breakfast first we make an inflatable dinghy-ride along the shoreline, followed by a ‘dry landing’ (with footwear) and a guided hike that crosses the crumbling, pitch black lava fields of Moreno Point (moderate level; about 2km/1.25mi). After a snack snorkeling is planned. PM: At noon we will sail for 2 hours to Elizabeth Bay. Meanwhile you can enjoy lunch and a siesta. On arrival a long dinghy-ride is scheduled to both the offshore rocks and sheltered mangles. Navigation: Before dinner we will continue to Espinoza Point (Fernandina, about 4hrs), while actively looking for whales. You will be able to enjoy a relatively quiet floating night. Moreno Point tells the continuing story of the famous lunatic lava fields of Sullivan Bay (actually not visited by Catamaran Nemo). This once lifeless lava field becomes dotted with tidal pools and filtration lagoons since parts of the crust have broken and fallen into the undermining lava tunnels. Pioneer life takes advantage; finally the lava cacti get company of two more species of cacti, from which the candelabras can grow up to 7m/23ft tall, and dominate the rest of the shrubby vegetation. Fringes of reed, sea grass and mangrove bushes transform the picturesque lagoons in lush oases. Your pictures get the perfect finishing touch when bright American flamingos forage in the largest lagoon as well. The fresh promising pioneer vegetation seems on the winning hand; just until Sierra Negra volcano spits a new layering cover, and the story starts all over again. Tidal pools form natural traps and attract scavengers and hunters, such as bright orange sally lightfoot crabs, oystercatchers and herons. During a dinghy-ride along the jagged shoreline, you can spot marine iguanas that wait patiently for their turn at lowest tide to graze weeds on the seabed, and a breeding colony of brown pelicans in the mangroves. Although there is no landing point, Elizabeth Bay offers actually two in one! A prolonged ride by inflatable dinghy combines the Marielas Islets in the mouth of the bay, with the mangles in its innermost heart. The Marielas islets are an excellent place to spot marine iguanas and small family groups of Galapagos penguins in the front row of the cliffs. The endangered Galapagos penguin is the rarest penguin species worldwide (just some 1500 birds over all archipelago; please don’t expect vast colonies as in Antarctic regions). Lofty palo santo-trees on top of the cliffs provide magnificent frigatebirds a lookout to rob returning blue-footed boobies. Next the dinghy will turn landwards and enter the calm estuary. Whilst exploring lagoons and shallow creeks, the outboard engine can be turned off, to enjoy sounds of nature. Brown pelicans are the only pelicans in the world that plunge-dive, though more superficial than the spectacular rocket like diving blue-footed boobies. Lava herons and great blue herons prefer to wait patiently for what comes along. Pacific green turtles swim graceful around, popping-up their heads for breathing (mating season: December-January). You may also encounter spotted eagle rays or sharks, looking for protected inlets to give birth and leave their young alone. This highest mangrove forest of Galapagos consists of red mangroves (with their characteristic prop roots) as well as black, white and button mangroves. Without any doubt Espinoza Point belongs to the more exclusive sites of the Galapagos National Park. Fernandina harbours one of the worlds most virgin, untouched ecosystems. Today you will become eyewitness of evolution, which is happening right in front of you! Wonder again about bizarre creatures as flightless cormorant, marine iguana and Galapagos penguin. Before leaving the remote west, Isabela will present you latest geological curiosity and the largest Galapagos land and marine iguanas. While crossing the Bolivar Channel to Urbina Bay, you will have opportunities for great whale watching again! AM: After breakfast and a dry landing the guided morning walk (easy/moderate level; about 2km/1.25 mi) runs over the lava tongue of Espinoza Point. After a snack we will bring you to today’s snorkeling site. PM: While having lunch we will cross the Bolivar Channel for the last time, back to Isabela’s west coast. At the geologic interesting site of Urbina Bay you will make a second guided walk, and you can snorkel as well. Overnight navigation: Before dinner we will start our 10 hour’s navigation around the north cape of Isabela to Santiago (crossing the equator two times). Espinoza Point is Fernandina’s only terrestrial visitors site, and one of the few locations where you will find some bizarre outgrowths of natural selection. Figurehead is the emblematic flightless cormorant that lives exclusively in the remote west of Galapagos, and could be considered as the ‘holy grail of evolution’. The cormorant had not to fear terrestrial enemies and lets you approach very close. Next generations gradually lost their flying capabilities to become excellent divers. Together with its neighbour, the Galapagos penguin, these are two of the rarest and most vulnerable bird species in the world, with less than 2000 individuals each. Besides the endemic wildlife, you will also love the almost unworldly views with the dominating cone of Volcán La Cumbre (= the summit) as a spectacular backdrop. The narrow headland that you walk is the end of a lava tongue that has reached the coast and solidified on contact with the cold seawater. The black rocks are not yet covered by more vegetation then lava cacti and mangroves, but are teeming with hundreds of dragon-like marine iguanas that breed and conglomerate in larger groups than in any other island. Urbina Bay presents you Isabela’s latest geologic curiosity. In 1954 tectonic forces lifted the former seabed several meters above sea level and formed present coastal plain. The tilted seabed ran dry at once and 6kms/3,75mi of coastline was shifted outward. Pretty far land inward you can find marine remnants, such as fish bones, shells, scales from lobsters, urchins and corals. Far behind you will reach the original coastline and the typical palo santo-bush from the arid zone. This very wide beach provides ample nesting places for iguanas, turtles and even for Galapagos giant tortoises that descend all the way down from Alcedo volcano in the wet season. The marine and land iguanas of Urbina Bay are the largest of Galapagos. At James Bay (Santiago) Charles Darwin spent most of his time in Galapagos, while HMS Beagle continued mapping the archipelago. Highlight of this pearl necklace of visitor’s sites are the outstanding fur seal grottos at the beautiful sculptured coastline of Puerto Egas, together with other coastal landscapes that could well be exotic film sets; not to forget Bucaneer’s Cove crystal clear snorkelling waters. AM: After breakfast you will make a guided walk along the coastline (easy level) to the fur seal grottos. Back on board we will provide a snack before snorkelling. PM: At lunchtime we will navigate 12km/7 mi/45 min north to Espumilla Beach. After a wet landing (bare feet) at the beach a guided walk leads uphill and land inward (easy level; about 2km/1.25 mi). Afterwards you can make a dinghy-ride (or alternatively sea kayaking) along the coastline. Overnight navigation: Before dinner SC Nemo I will continue along the north coast of Santiago to Daphne Major, where we will arrive after about 4 hrs for a relatively quiet floating night sleep. Dominated by Sugarloaf Hill (395m/1300ft) and named after a former salt mine (1960s), Puerto Egas is the southernmost visitors site along James Bay. Its masterly sculptured coastline of black basalts and polished multi-coloured ash-layers forms a photogenic scenery with collapsed lava tunnels, natural arches, caves and blowholes such as ‘Darwin’s toilet’. In a grotto right below a spectacular rock arch at the end of the beach a colony of Galapagos fur seals occupies the shade, sheltering from the equatorial sun. Unlike more common Galapagos sea lions this smaller species of seal is no beach lover at all, due to their adorable, but insulating coats. This refuge is the very best place to see these endemic, shy and once heavily hunted marine mammals. Especially at low tide Puerto Egas teems with extremely varied intertidal life. Notice how marine iguanas just leave, return cold or warm-up after grazing weeds on the seabed at lowest tide. Ossified night herons and lava herons keep an eye on the tidal pools that are refilled every flood again with small fish, octopuses, star fish, snails, urchins, shells, green algae and many other snacks. Noisy oystercatchers, turnstones, plovers and whimbrels inspect these pools zealously. Hundreds of sally lightfoot crabs seem even brighter orange against the pitch-black rocks (immature are dark-coloured). Espumilla Beach has revived as an important breeding site for turtles, as it is no longer suffering from digging wild pigs. The turtles return year after year to burry their eggs into the cinnamon coloured sand dunes. About two months later (roughly from February to August) the eggs hatch at once. Most vulnerable hatchlings never will reach sea, and form a banquet for predators such as herons, frigatebirds, mockingbirds and ghost crabs. As often in Galapagos, different vegetation zones are very close by, providing great scenic contrasts. During the climb of a hill you will be rewarded with a beautiful overview of the transitions from sea into beach into mangrove into dry palo santo forest. At the nearby Buccaneer Cove we have a great snorkeling opportunity. On your last morning in Galapagos you can feel the ocean breeze in your hair while navigating around the characteristic volcanic islet of Daphne Major. A wide range of sea birds will wave you out! AM: Early morning Sailing Catamaran Nemo I will navigate around the characteristic volcanic islet of Daphne Major. Afterwards you will disembark and fly back from Baltra Airport to Quito or Guayaquil. The characteristic offshore tuff cone of Daphne Major looks how a child draws a volcano islet. Perhaps you have already got a first glimpse of it from your airplane window on arrival. Access to the 120m/400ft high islet is restricted because of its fragility and susceptibility to erosion. On your last morning in Galapagos you will make a dinghy-ride around. You can spot large flocks of storm petrels and other sea birds. This islet forms an almost undisturbed semi-closed ecosystem and is therefore of great scientific interest. Coexisting Nazca boobies, red-billed tropicbirds, magnificent frigatebirds, blue-footed boobies and 8 other breeding species have nicely distributed different sections of the cone, according to their needs and the ecological niches they occupy. The caldera contains two craters, both completely white-plastered by the increments of blue-footed boobies, which have founded a very large breeding colony on this sheltered place. There is a colony of Galapagos sea lions on the only small beach. This islet also has been the location for an important multidecade study of Darwin’s finches. This concluded that population fluctuates strongly and finches that survived in dryer years were mainly the ones with larger beaks; results that supported strongly Darwin’s theory of natural selection and evolution. Of course families with children are very welcome on board! But we suggest that your children are at least 3-4 yours old, so that they enjoy the experience as well and endure the intense trip. Maybe it’s better to consider waiting a few years until they realize how special Galapagos is. We don’t offer special children’s programs, but they will love the nearby animals, and our activities as swimming, snorkelling and sea-kayaking. Parents are responsible for their kids, and have to take into account that they might not undertake longer or more difficult excursions or activities. We have special discounts for children younger than 12 years (-20% for 1 child per 2 parents), as the airlines have, as well as reduced fees for the Galapagos National Park. *Some trails are longer or more difficult, with sharp lava rocks or even some light scrambling; The B4-Route of Yolita II does’t count with difficult trails, and is easier accessible. *When embarking and disembarking the inflatable dinghy, especially when the surf is a bit rougher (although our crew is always there to help you in and out safely). *Please check also in our yacht design whether the steps on board are suitable for you. 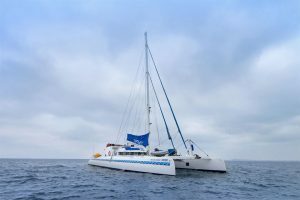 *Motor Catamaran Treasure of Galapagos evades long overnight crossings and generally arrives at its destination before midnight, guaranteeing a comfortable night rest. *Return flight to Galapagos **. Your flight space to the Galapagos is automatically guaranteed for all bookings made one month prior to departure or earlier. For a cruise booked at shorter notice we will reserve the flights as well. *Personal expenses, Extras and Tips. ** The airfare is subject to change; we will provide you with the rate the moment you book. *** Please note that the entrance fee for the Galapagos National Park and Transit Card are subject to change. **** Single passengers that are willing to share their cabin with another person of the same gender, NEVER PAY an additional single supplement fee in case no room-mate has booked. ***** For wetsuit hire we need to know your size maximum 2 weeks before your travel to Galapagos (S/M/L/XL). We rent standard wetsuits of 3 mm. 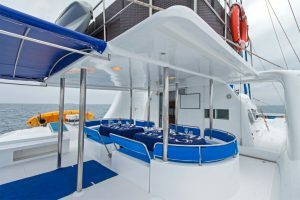 Nemo I Yolita II, San Jose 4/5 days tour: $25; 8 days tour: $35; Galapagos Odyssey: US$ 6 per person per day (has to be paid in cash). *A passport is required. Your travel agency can advise you of any visa requirements when traveling to Ecuador. *Before checking-in on the airports of Quito or Guayaquil, every visitor to Galapagos must purchase a Galapagos Transit Control Card (US$ 20 per person in cash, since March 1, 2015), apart from the Galapagos National Park entrance fee (for international passengers generally US$ 100 per person in cash). This visum-like ID card helps INGALA restricting migration and visits to the islands. Please keep this ticket carefully with your passport as you will need to show it again when you leave Galapagos. Domestic airline regulations permit 20 kilos (44 lbs) per person for your luggage excluded small carry-on flight bags. See also the list with our suggestions. We recommend not to bring access luggage when you have booked a cabin on sailing catamaran Nemo I. 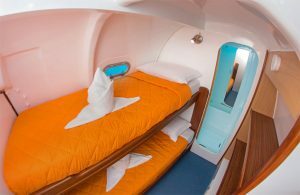 The storage space in these cabins is limited, but there is some additional storage room available on board. Incidental expenses on board and suggested tipping fees just can be paid in cash US Dollars. A certain provider might have connection on one of the uninhabited islands (including Española ! ), while another has not. Most remote islands such as Fernandina, northern Isabela and Genovesa are NOT covered by these communication networks, so over there you still can enjoy Galapagos fully undisturbed. In emergency situations the crew can always communicate to the outer world by radio. We neither have WIFI or Internet on board, nor a satellite telephone. Yes you can. In your cabin are US-style electrical outlets of 110V. Don’t forget to bring adapters when you come from a country where distinct outlets are used. See the list which clothing is practical during your cruise, for the different activities and climate zones. To safeguard the safety and health of our passengers, a nonsmoking policy is enforced in the interior and most social areas. Once aboard please inform where it is allowed (generally it is only permitted on the Sun deck or in case of the Galapagos Odyssey on the stern of the Main deck). When smoking, please do not throw cigarette butts over board. Please note: On the islands inside the National Park smoking is strictly prohibited.